The flavours of chicken and lemon combine well to create this fresh-tasting Chinese dish. Trim the chicken thighs and cut into bite sized pieces. Combine the salt, pepper, sherry, lemon zest, egg and flour paste, add the chicken pieces and stir to coat well. Allow to marinate in the refrigerator for 25-30 minutes. Meanwhile, make the sauce by heating the sunflower oil in a small saucepan until hot. Reduce the heat, then carefully add the stock, sugar, lemon juice and zest and stir well. When the sugar has dissolved add the cornflour and bring to the boil, stirring continuously. Reduce the heat and simmer for 1-2 minutes. Add salt to taste then remove from the heat until required. Heat the groundnut oil in a large frying pan or wok to 180°C. 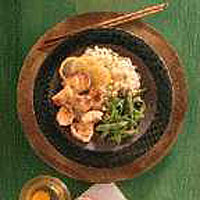 Cook the chicken in two batches for about 4-5 minutes or until thoroughly cooked. Drain on kitchen paper and keep warm. Serve immediately, garnished with lemon slices, and accompanied by the lemon sauce, Waitrose Egg Fried Rice and a selection of lightly stir-fried green vegetables.